(Nanowerk News) Physicists have taken major step forward in the development of practical phonon lasers, which emit sound in much the same way that optical lasers emit light. The development should lead to new, high-resolution imaging devices and medical applications. Just as optical lasers have been incorporated into countless, ubiquitous devices, a phonon laser is likely to be critical to a host of as yet unimaginable applications. Two separate research groups, one located in the US and the other in the UK, are reporting dramatic advances in the development of phonon lasers in the current issue of Physical Review Letters. The papers are highlighted with a Viewpoint by Jacob Khurgin of Johns Hopkins University in the February 22 issue of Physics. Light and sound are similar in various ways: they both can be thought of in terms of waves, and they both come in quantum mechanical units (photons in the case of light, and phonons in the case of sound). In addition, both light and sound can be produced as random collections of quanta (consider the light emitted by a light bulb) or orderly waves that travel in coordinated fashion (as is the case for laser light). Many physicists believed that the parallels imply that lasers should be as feasible with sound as they are with light. While low frequency sound in the range that humans can hear (up to 20 kilohertz) is easy to produce in either a random or orderly fashion, things get more difficult at the terahertz (trillions of hertz) frequencies that are the regime of potential phonon laser applications. The problem stems from the fact that sound travels much slower than light, which in turn means that the wavelength of sound is much shorter than light at a given frequency. Instead of resulting in orderly, coherent phonon lasers, miniscule structures that can produce terahertz sound tend to emit phonons randomly. Researchers at Caltech have overcome the problem by assembling a pair of microscopic cavities that only permit specific frequencies of phonons to be emitted. They can also tune the system to emit phonons of different frequencies by changing the relative separation of the microcavities. The group from the UK's University of Nottingham took a different approach. They built their device out of electrons moving through a series of structures known as quantum wells. As an electron hops from one quantum well to the next, it produces a phonon. So far, the Nottingham group has not demonstrated a true phonon lasing, but their system amplifies high-frequency sound in a way that suggests it could be it a key component in future phonon laser designs. Regardless of the approach, the recent developments are landmark breakthroughs on the route to practical phonon lasers. 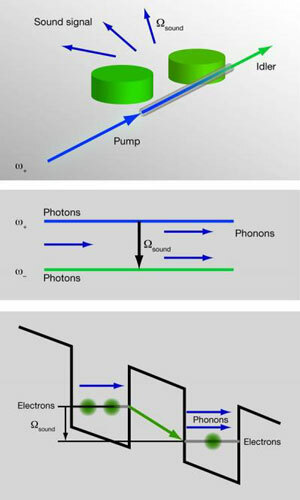 Phonon lasers would have to go a long way to match the utility of their optical cousins, but the many applications that physicists have in mind already, including medical imaging, high precision measurement devices, and high-energy focused sound, suggest that sound-based lasers may have a future nearly as bright as light lasers.